“We demand a clarification from the IWF. Similar incident had occurred to Manipuri players in the past and we will not remain silent to such blunders. We will continue our protest supporting Sanjita, until the truth is brought about,” a women's group representative said. Weightlifter Sanjita Chanu protested against the results of the dope test. Following the ban on weightlifter Sanjita Chanu, who tested positive for a banned anabolic steroid, women’s bodies and students of Sports Authority of India (SAI), Manipur on Sunday staged a protest demanding clarification from the International Weightlifting Federation (IWF) on the ‘controversial’ dope test. The weightlifter was also present at the demonstration, which was held in her locality. Representative of a women’s body, M Shanti, strongly opposed the ban on Sanjita Chanu despite reports of confusion in samples. “We demand a clarification from the IWF. Similar incident had occurred to Manipuri players in the past and we will not remain silent to such blunders. We will continue our protest supporting Sanjita, until the truth is brought about,” added M Shanti. Manipur Chief Minister N Biren Singh had sought intervention of Union Sports Minister Rajyavardhan Singh Rathore to obtain a review into the suspension order of the weightlifter. In a letter to Rathore, Biren pointed out that there was a glaring error in the laboratory sample identification which indicates the possibility of mixing up or exchange of samples. Sanjita Chanu also doubts if the sample, which tested positive, was hers while she contended that she had never consumed any banned substance. A fellow weight lifter of SAI, has appealed to the Indian Weight Lifting Federation (IWLF) and IWF to take up joint initiative to clear the controversy surrounding the test samples of Sanjita. The recent incident has demoralised the Manipuri players, she added. 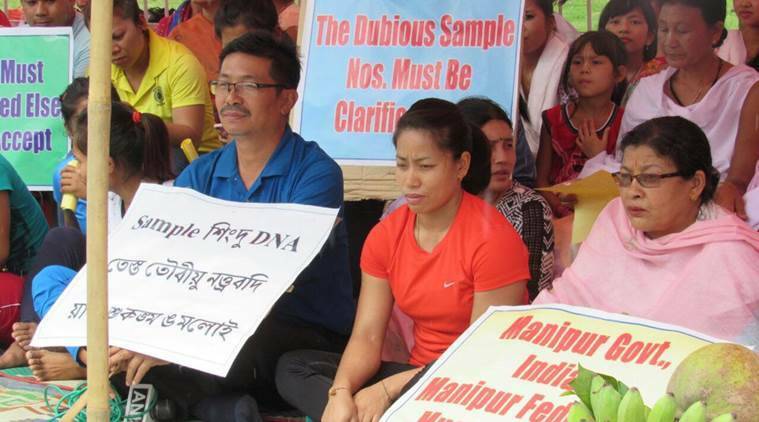 Protesters held placards and banners which read, “The dubious samples numbers must be clarified”, “We strongly condemn the conspiracy of Sanjita’s doping case”, “We demand DNA tests of the samples”.